We sell a lot of kale at the grocery store! 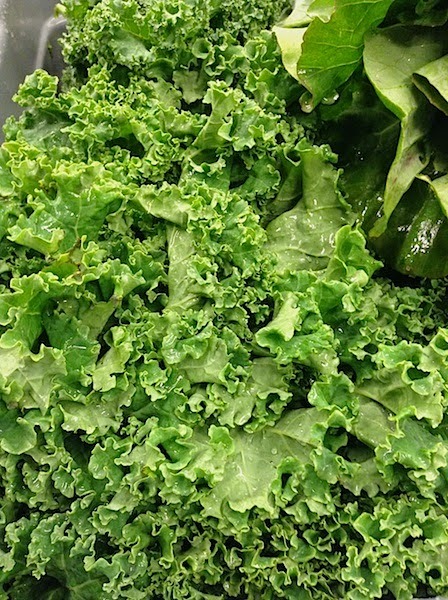 It's difficult to believe that kale was once the leafy green that was impossible to find. Really? Yep! Now, it's everywhere. Despite "foodie predictions" which love to announce its demise, kale shows no sign of disappearing. And I say that as a clerk in the produce department of a large grocery store. Recently, kale has found its way into pre-packaged salad mixtures and even fresh, mixed greens for making smoothies and powdered mixes for the same. I was first introduced to kale in the 1980s via an Irish stew recipe. Wonderful. Unlike spinach, kale's wooliness holds up well in dishes that require a long braise or simmer, such as a stew. I have since lost this recipe. It was from the PBS series, The Victory Garden, with Mariane Morash. If anyone has the video or recipe, please let me know. This is a rather simple dish to prepare, with the exception of the wild rice which takes some time. Now, however, one can actually purchase wild rice already cooked in a pouch and ready to go! Me? I'll stick to the old-fashioned way. To add more flavor, cook both rices in a bit of chicken or beef stock (or both). Feeling adventuresome? Add a bit of raisins (or dried cranberries) when you saute the onions. 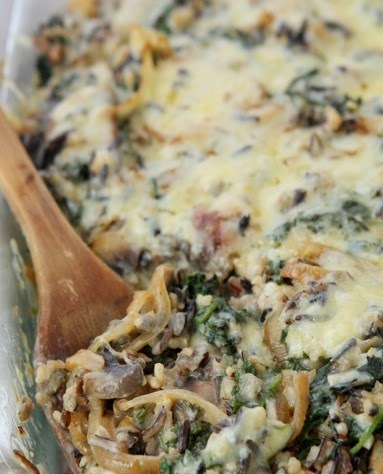 You may serve this immediately right from the pan, but I prefer to place it in a casserole dish and sprinkle with a bit of Parmesan or Gruyere and bake just until the cheese melts. This is a great make-ahead side. And it pairs beautifully with my recipe for baked carrots. Heat the oil in a saucepan over hight heat for a couple of minutes to get it really hot. Add the mushrooms and season generously with salt and pepper to taste. Saute until the mushrooms give off their water and it evaporates a bit and the mushrooms begin to brown. Reduce heat to medium. Add the onion and saute until softened and translucent. Add the garlic, thyme. Season with salt and pepper. Add the kale and cover tightly with a lid so that the greens wilt. Once the greens have wilted slightly, toss with mushrooms and onion mixture and saute until the kale becomes tender but still retains a bright green color. Add more oil if the mixture is dry. Add the rices and stir all the ingredients together. Add nutmeg, if using. Season with salt and pepper to taste. Remove from heat and sprinkle with cheese. Cover slightly until cheese melts. To make one day ahead, place mixture in a covered casserole dish about 10 x 6 or 8 x 8. About one-half hour before serving, sprinkle with fresh Parmesan or Swiss-like cheese and bake for about 20-30 minutes in a 350 F oven or until warmed through.